The Crew received the award at the annual Trophies & Awards Banquet at the London Guildhall. At 21:22 local time on the night of 9 February 2013, Rescue 912 (R912) was tasked to the aid of three bird hunters who had become stranded in their 16-foot aluminium boat. The hunters' attempts to return to the safety of land were unsuccessful after their route was engulfed with large amounts of ice. The weather had been forecast to worsen throughout the day, and at this point had become a full-on winter blizzard with expected accumulation of 40cm of snow and gale force wind warnings across the island of Newfoundland gusting up to 75km/h. The hunters' chances for survival were rapidly diminishing as they had now been exposed to these conditions for almost 20 hours. As aircraft commander Captain Aaron Noble, along with first officer Captain Jonathon Groten, planned the mission, they discovered that the inclement weather required the crew to hold Deer Lake, an airport 110nm from the departure aerodrome, and more than 140nm from the hunters' location, as an alternate recovery airport. The crew increased the fuel load to 3000 kg, which would allow transit to the hunters, 45 minutes on scene to conduct the rescue, and the potential diversion to Deer Lake, while at the same time remaining within safe weight limits for the extraction. Gander airport snow clearing crews were also dispatched to clear a path from the squadron doors to the departure runway as large amounts of snow had accumulated and created large drifts on the aerodrome. At 22:22 local time, R912 departed Gander airport in conditions of less than a mile visibility and approximately 200ft cloud base, encountering icing conditions immediately after departure. Due to high winds, it took 30 minutes to make the 40nm flight. Upon arriving on scene, the crew found the narrow inlet of Indian Bay still immersed in a blizzard. The flight routing was extended several miles past the hunters to open water in order to conduct an overwater transition to arrive in a 100ft hover above the water. Just above minimum limits, SAR tech team lead, Master Warrant Officer (MWO) Jeffrey Warden spotted the water from the left spotter window. Once the helicopter established itself in the hover, the crew's visibility in the storm was limited. Unfortunately, due to the rugged topography the three hunters were now approximately eight miles away, and R912 would now be forced to navigate among many islands and into the narrow inlet to reach them. The crew slowly crept their way toward the hunters at five knots through the smattering of islands, into Indian Bay. This proved to be extremely challenging with up to 80km/h winds on the tail of the helicopter, and severe topographical turbulence off the surrounding 300ft hills. Wind and turbulence conditions had become so severe that Captain Noble considered calling off the rescue twice – standing-down the mission seemed imminent. As a last ditch effort to save the hunters' lives, with approximately two miles remaining, the crew decided to action an impromptu manoeuvre. It would be the only hope for the distressed hunters. Captain Noble turned the helicopter 180 degrees - placing the nose into the storm - to provide a more stable flying platform, and the crew would have to navigate him the final two miles among the islands flying backwards. Tremendous crew co-ordination was essential to the success of this manoeuvre. With Captain Groten on the map, flight engineer Sergeant Bradley Hiscock on the right in the rescue door, MWO Warden in the left spotter window, and the second SAR tech, Master Corporal Mark Vokey, at the tail, the crew successfully guided Captain Noble backwards toward the hunters' last known position, at which point MWO Warden spotted the hunters' lights and two red flares. Having taken longer than anticipated to reach the hunters due to the complexity of the manoeuvring, R912 was now at its estimated minimum fuel level required to reach Deer Lake should it become necessary. The crew had to once again consider the implications of continuing the mission, and after quick discussions and fuel recalculations, they readied for the extraction. It was decided that, as a last resort, they would rescue the hunters and land on the rugged shoreline. With minimal references over the ice and open water, Captain Noble fought to maintain a steady hover, while Sergeant Hiscock and Master Corporal Vokey subjected themselves to the full scale of the storm and -22C wind chill. Master Corporal Vokey was hoisted into the blizzard and down to the distressed seamen, fighting through the storm's intensity, fierce rotorwash, and static electric shock from the aircraft. Battling tremendous swing on the hoist, Sergeant Hiscock performed to an exacting standard and inserted Master Corporal Vokey into the small boat where he quickly triaged the three survivors and readied to hoist them in proper order. Sergeant Hiscock and Master Corporal Vokey repeated these vigorous procedures until all three hunters were safely hoisted onboard to awaiting MWO Warden. With radar and GPS depicting surrounding topography, the crew prepared for departure. Both pilots transitioned to instruments and executed a straight-ahead maximum rate climb to clear the surrounding hills. Once at a safe altitude and now at the very minimum fuel level to reach Deer Lake, the crew had to decide whether to attempt Gander, or to head directly to the alternate - the fuel level would not allow them to do both. Gander Centre reported a slight improvement in the conditions at Gander airport, and with the three hypothermic hunters needing medical attention as soon as possible, the crew decided to head to Gander. The ILS approach to runway 13 at Gander airport was successful. R912 broke out of IFR conditions slightly above minimum allowances, and landed without incident. The three hunters were transferred to an awaiting ambulance where they were brought to medical care. The courage, expertise, resourcefulness and quick thinking displayed by the crew of R912 during this rescue demonstrates remarkable professionalism and achievement under trying circumstances, ultimately leading to the saving of three lives. The crew is accordingly awarded the Prince Philip Helicopter Rescue Award. Awarded to an individual member of a helicopter crew, a complete crew or the crews of multiple helicopters, for an act of outstanding courage or devotion to duty in the course of land or sea search and rescue operations. 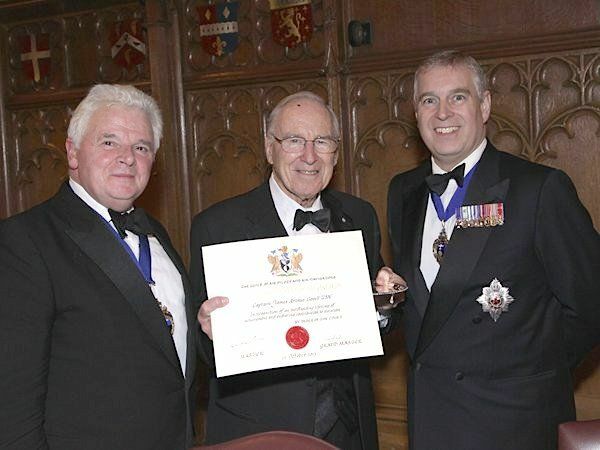 HM The Queen granted a Royal Charter to the Honourable Company of Air Pilots in February 2014. That is what SAR is all about. A cracking effort. Well done gents. Scary stuff; well done is the least you can say. Anyone know the aircraft type? The crew did a magnificent job. They were understandably thrilled to receive their award from Captain Jim Lovell, commander of Apollo 13, but he was equally impressed by their achievement. 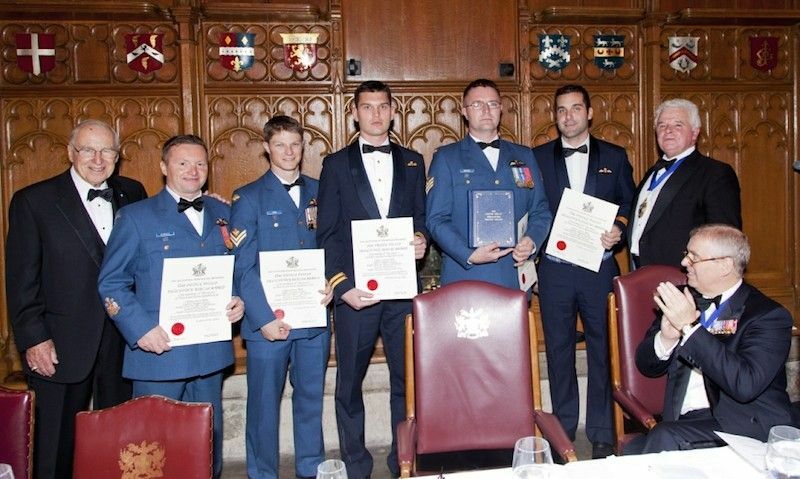 Two of them, Captain Aaron Noble (aircraft commander) and Sergeant Brad Hiscock (flight engineer), were members of the crew of 'Rescue 195' which won our Award for Gallantry in 2012 for a rescue mission in the Arctic which spanned 1500 nautical miles and 14 hours of flight time. Anyone know the aircraft type? AgustaWestland CH-149 Cormorant, the Canadian Forces designation for the AW101. A well deserved honor. Rotary Wing excellence, it does a body good! Well done to all concerned. 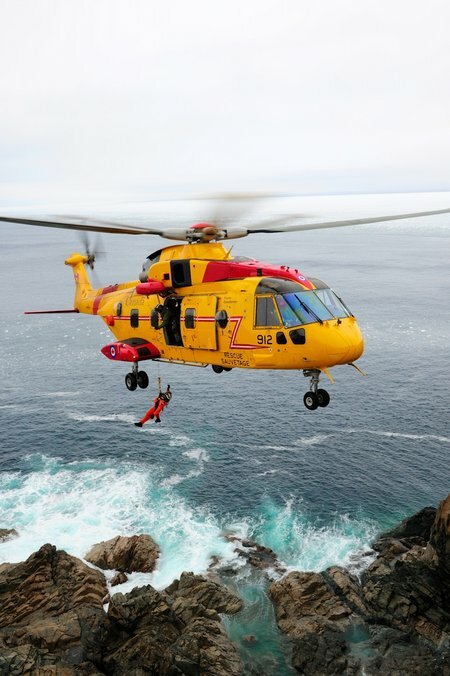 An excellent SAR job!! My regards to the crew. Our Canadian friends should sleep well at night knowing men such as this are protecting them. I think that sums that flight up very precisely. How does one practice flying backward for two miles in that kind of weather? Somehow I think you don't, it just takes experience and extraordinary piloting skills. I am impressed beyond words. RCAF crews are trained ( as I am sure are many others) in flying to the orders of spotters when lowering into tight spaces or flying backwards but I am sure doing it in those conditions must have been scary as hell. Always proud of the RCAF. A remarkable effort to say the least. Reading the citation had me on the edge of my toes. Congratulations to the crew - a credit to the RCAF and their proud nation. A reminder that nominations for this year’s Trophies and Awards close on 31 May. If any members (or others) have suitable nominations, please ensure they are received at the office (send by email) by this date. Well done to the crew(s) in question. I'm guessing their training must include "flying backwards" though ? Not exactly something you can do on a whim ? Visited No 1 son ( RCAF SARS pilot) who was doing a mountain flying course put on by a civilian contractor in BC. They were flying the gorges around Penticton and he explained to his mum that the standard clearance for his level of training was three rotors width, ie. two blades' width from the rock so it was quite safe. Apparently the next level is one blade's width clearance. "I guess that's when you're fully qualified then," I said. I hoped his mum wasn't listening too carefully. Last edited by ChrisVJ; 28th May 2014 at 02:41. Best thing I've read in ages. Saying ''Well done'' seems inadequate, they certainly earned their flying pay on that mission.